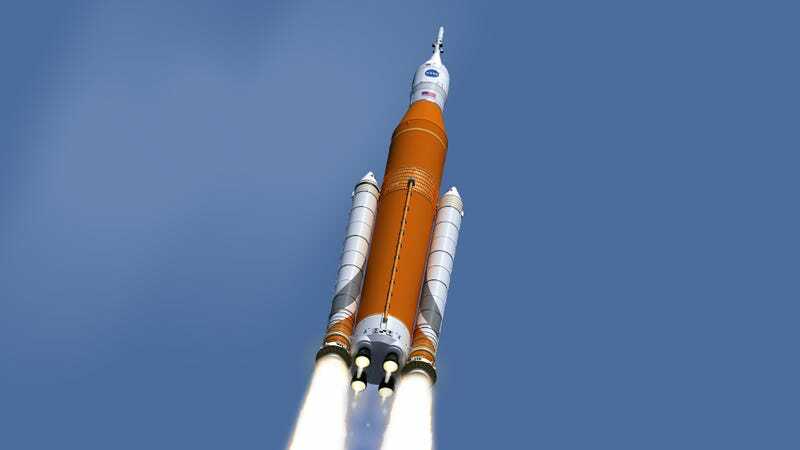 Late next year, NASA is hoping to launch its Space Launch System—a powerful next generation rocket capable of exerting two million pounds of thrust. NASA engineers have now completed construction of a stand sturdy enough to test its enormous fuel tank. 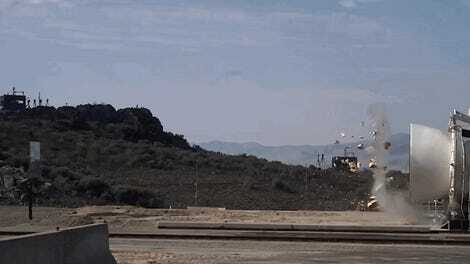 It’s an important milestone, and another step towards sending humans to Mars. Construction on test stand 4693 began in May 2014 and finished in December 2016. The structure stands 221 feet (67 meters) tall, and is located at NASA’s Marshall Space Flight Center in Huntsville, Alabama. To commemorate the end of the major construction phase, NASA released a 60-second timelapse showing the platform as it was being built. Engineers are now installing the equipment needed to test the rocket’s biggest fuel tank, including cables, pipes, valves, control systems, cameras, lighting, and specially-designed test equipment. This test site will be critical in ensuring that the SLS’s 537,000-gallon liquid hydrogen tank can withstand the extreme forces it’ll have to endure during launch. This tank is part of the SLS’s massive four-engine core stage, which is slated to send the Orion spacecraft and its four occupants on a journey around the moon. Importantly, it’s the same technology needed for the journey to Mars. The new stand is designed to simulate the powerful dynamics of launch and flight by pushing, pulling, and bending a prototype of the 149-foot-long liquid hydrogen tank, which was recently constructed by Boeing at NASA’s Michoud Assembly Facility in New Orleans. This tank is so big and heavy that it’ll have to be delivered to the test site on a barge. 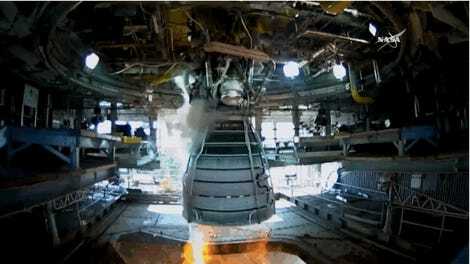 Once mounted on the stand, the liquid hydrogen tank, along with a liquid oxygen tank, will feed 733,000 gallons of super-cooled propellant to four RS-25 engines, producing 2 million pounds of thrust at the base of the core stage. A total of 38 hydraulic cylinders, ranging in weight from 500 to 3,200 pounds, will be positioned at points along the tank to simulate the thrust produced by the RS-25 engines. During testing, these cylinders will extend and retract, pushing and pulling in different combinations to expose the hydrogen tank to the conditions expected at launch. These cylinders, or “loadlines,” are capable of applying millions of pounds of both pulling and crushing force, and up to 340,000 pounds of shearing (or sideways) force. As this is happening, more than 3,500 individual measurements will be taken, including temperatures and pressures. Over 30 different tests are scheduled in a process that’ll take several months. Lastly, the new stand will be equipped with high-definition cameras, so get ready from some really cool visuals once testing begins later this year!